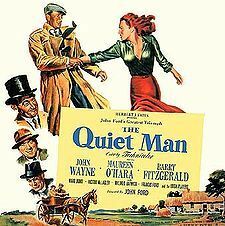 The Quiet Man is a 1952 American romantic drama film directed by John Ford and starring John Wayne, Maureen O'Hara, Victor McLaglen and Barry Fitzgerald. It was based on a 1933 Saturday Evening Post short story by Maurice Walsh. The film is notable for its lush photography of the Irish countryside and the long, climactic, semi-comic fist fight between Wayne and McLaglen.